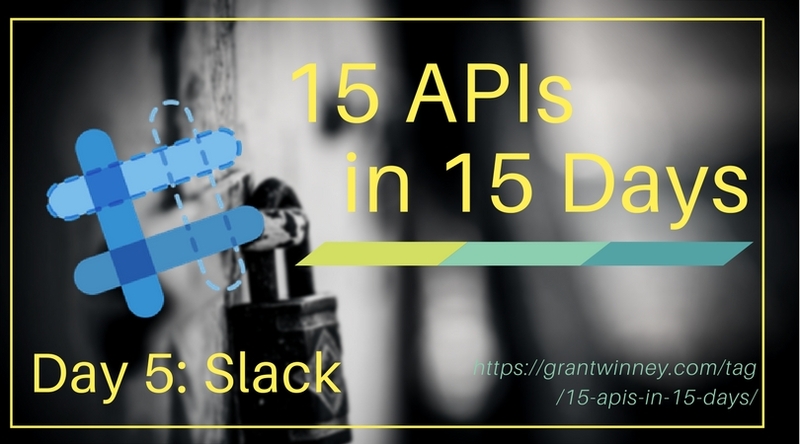 Continuing my 15 APIs in 15 Days challenge (also on GitHub), I thought I'd check out the Slack API. Slack is a popular communication and collaboration tool. About your "team" - select "other" and "1-10 people"
Now that you've got an app, you need to decide what you want it to do. I'm glad they have apps scoped like this - it's very similar to creating browser extensions and phone apps, where not everything has access to everything, and the user must explicitly "grant" permissions. On the same page, scroll back to the top and press the "Install App to Workspace" button. 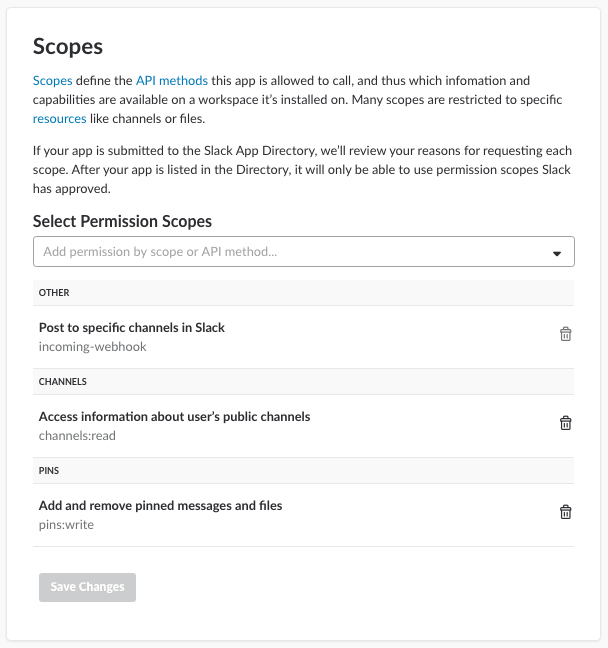 You'll be notified about what permissions the app needs - just click "Authorize". I also created a new channel named "testing", so that I could select it here, but you can just select a built-in channel from the dropdown if you'd like. It should've redirected back to the "OAuth & Permissions" section. 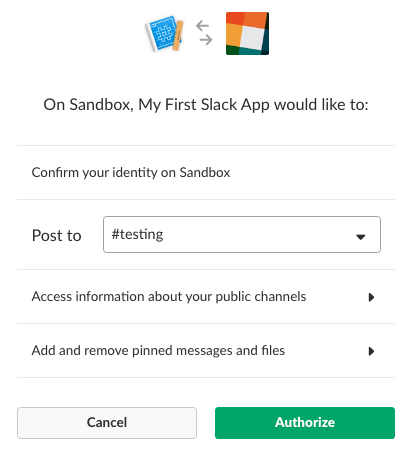 This is the auth token you'll need when you make requests to the Slack API. Now you can actually try some API methods. For most of these, I think you need at least the Authorization and Content-Type headers - although the latter isn't always required, it won't hurt to include it. The first thing we'll try is listing channels. In Postman, do a POST and include the headers above. The JSON body only needs to have your auth token. You should get a result similar to this. My results include three channels - the default "general" and "random" ones, and also my "testing" one. Note how each channel has an "id" too. It appears that many (most? all?) of the requests that operate on channels require an id, not a name. 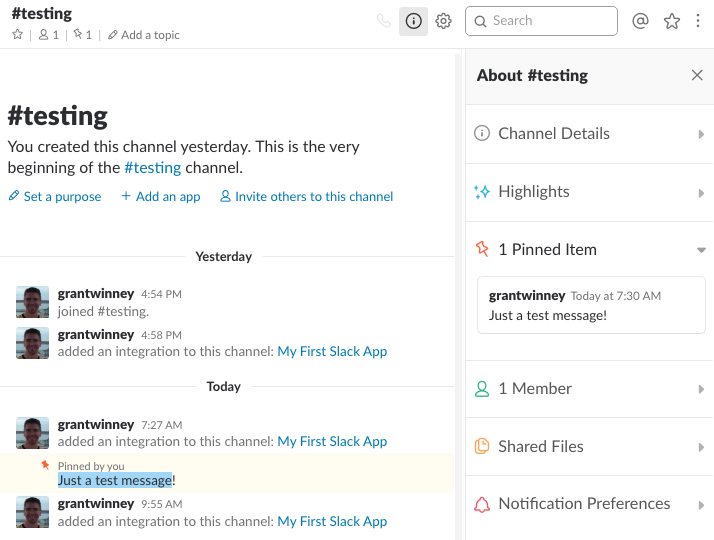 Now that you've got your channels, switch over to Slack and type a message into the channel you're interested in. Anything is fine - I typed "Just a test message!" into my "testing" channel. Try retrieving the messages from your channel, including the message you just added. 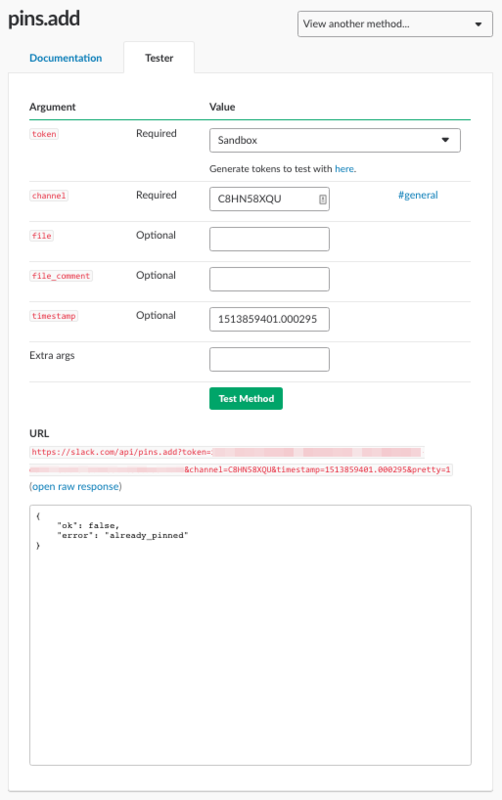 Most of the API calls can be made in two ways - either with a JSON body like I did above, or as query string parameters, which seems to be what we have to use with this one, as the JSON body doesn't work. Oddly, either a POST or GET works... a GET seems more intuitive for requesting information, so that's what I used. Here's the result I got back. See my test message? See the timestamp on it? If you're following along, grab the timestamp for your message too - you'll need it. Now that you've got the id for your channel, and the timestamp for your message, you can use one of the pin methods - the pins.add API call - to pin the message to the channel. The result doesn't tell us much, other than it hopefully succeeded. Checking the channel though, you should be able to confirm the message is pinned on the right side. Success! 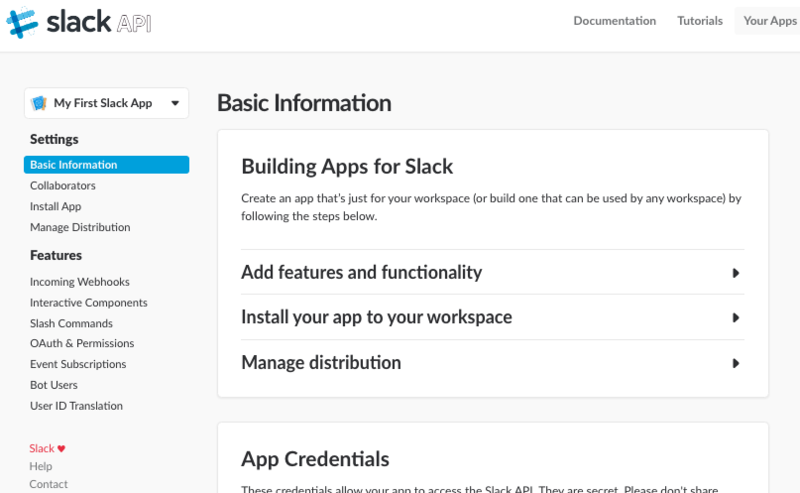 Similar to the Dropbox API and its API Explorer, the Slack API lets you explore it online too, generating the code for you to copy when you're satisfied. This is super convenient for trying things out. If you have an auth token already, there doesn't seem to be a place to paste it in here - just click the button and follow the prompts to generate another one. Note how we present the token with the string Bearer pre-pended to it, indicating the OAuth 2.0 authentication scheme. Consult your favorite HTTP tool or library's manual for further detail on setting HTTP headers.